On Friday 13 July, Malaysian blogger Nathaniel Tan (jelas.info, suarakeadilan.com, bangkit.net) was arrested by authorities there. He is currently under remand while police conduct an investigation into his alleged violation of section 8 of the Official Secrets Act, which pertains to "wrongful communication, etc. of [an] official secret." Tan and another blogger had posted a digitally manipulated photo of the Deputy Prime Minister dining with a Mongolian murder victim. It is unclear at this point whether Tan has been granted access to legal counsel; according to those who have been able to speak with him when he appeared in court, he has not been given clean drinking water. Tan is widely considered to be a prominent online voice in Malaysia; one of his sites, bangkit.net, is a portal for Malaysian civil society groups. According to provisions within the Malaysian Multimedia Bill of Guarantees, the government is not allowed to censor the Internet; Tan's arrest reflects the government's increasing resistance to that freedom of speech. 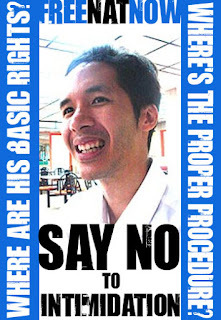 Supporters have been asked to post this image of Nathaniel Tan on their blogs. We here at probably awkward ask any and all of our blog-writing readers to pass this along on their own sites. more info about Tan's detainment here and here.